Oh My God it’s Dieu du Ciel! | Beer Is God. Oh My God it’s Dieu du Ciel! 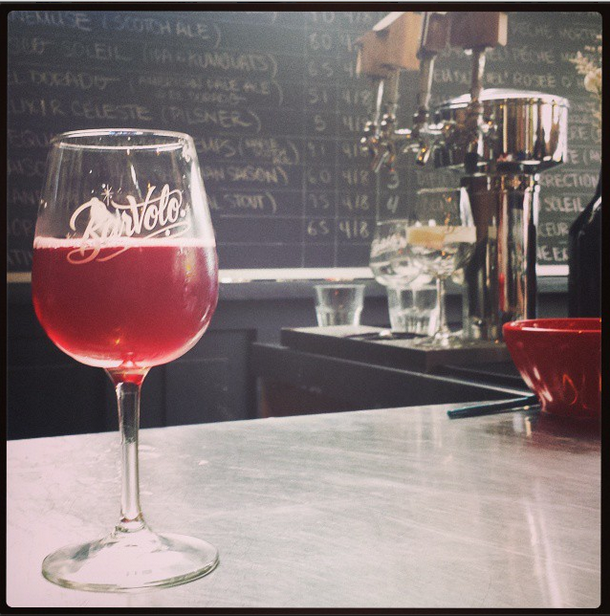 What can I say about Dieu du Ciel’s “summer solstice” tap takeover at Bar Volo? I chatted beer with Ralph Morana, Stéphane Ostiguy, Mike Lackey and Iain McOustra. 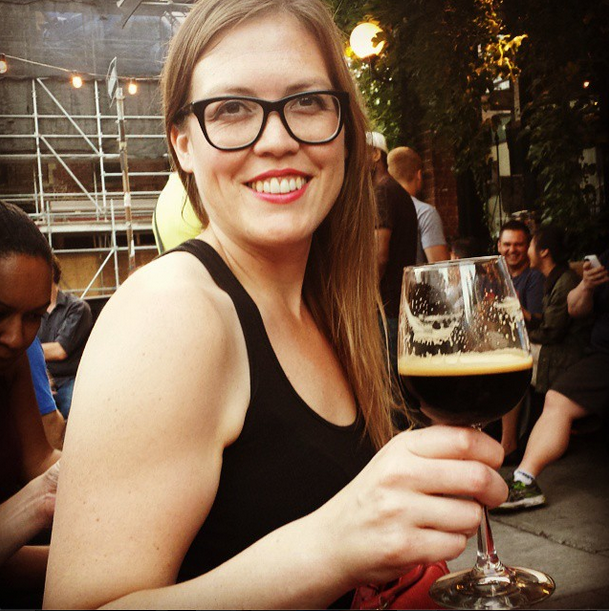 I learned about many nerdy things that mean huge gains for Toronto’s beer scene. I tried a very rare sour beer brewed with mango, and the delicious Bourbon barrel aged sour called Exorciste, which went very fast. Kumquat IPA Disco Soleil was perfect on cask: well balanced, fruity and creamy. And then there were all my classic Dieu du Ciel (DDC) favourites, such as Charbonnière, a smoked ale (Rauchbier). The closest most Torontonians have gotten to DDC is by trying the Rosée d’Hibiscus at one of Toronto’s many craft beer bars. 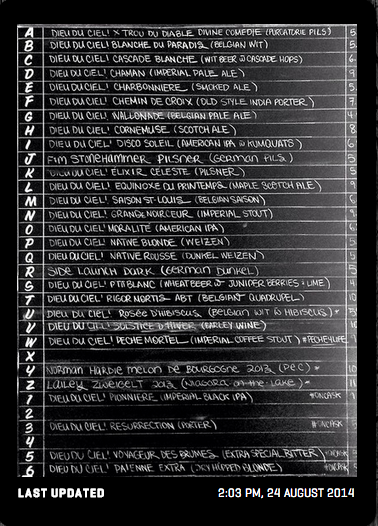 For those not in the know: Montréal microbrewery DDC was started 16 years ago by Stéphane Ostiguy and brewmaster Jean-François Gravel. Both did their masters in molecular biology. Jean-François had been homebrewing for many years, and started DDC with an intention of innovation. At the time, all the other five brewpubs in Montréal were offering two to four brews. DDC started with six. To date, they’ve brewed well over 100 beers. I first tried them when an ex brought back cases of DDC beers from a trip to Quebec. The variance, mastery, and design all won me over. DDC is world class beer. My first smoked beer? Charbonnière. First variance of incredible strong stouts? Péché Mortel and Aphrodisiaque. First barley wine? Solstice d’Hiver. Even after trying many varieties of these styles, DDC’s stand out. I could go on and on about their godly branding (which I bet is a result of being raised in religious Quebec), and their beautiful label art, which stems from Gravel’s university friendship with artist Yannick Brosseau. 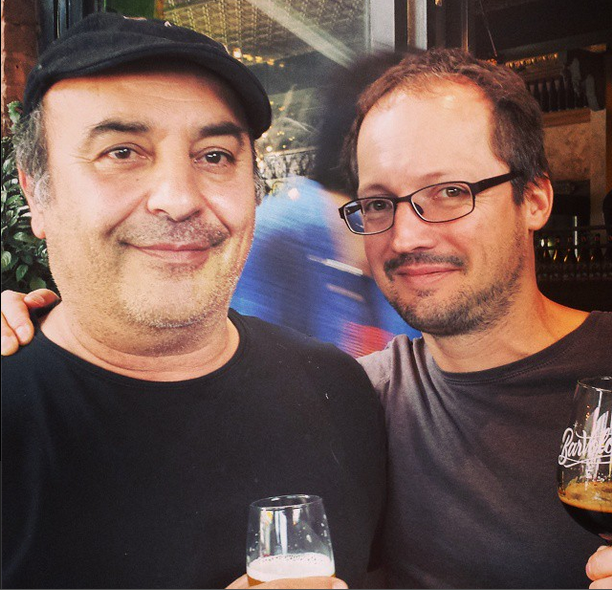 Instead, I will tell you that Volo’s owner Ralph Morana met Stéphane the year before the first Cask Days (2005), and they’ve been making beer history ever since. Morana originally opened Volo as an Italian restaurant without knowing much about wine, and like many people who start learning about wine…. he got into beer. In addition to being one of the first (family-run!) craft beer bars in Toronto, Volo brews beer, runs events, designs and imports beer. They’re the reason DDC has been available in the LCBO for the last four years. You can always get DDC beer at Volo, but the tap takeover’s leftovers mean that you should go ASAP. Look at this list. What’s next for Volo? Only the biggest beer nerd event in the city: Cask Days is happening at the Evergreen Brick Works October 24-26. Tickets go on sale September 1st.